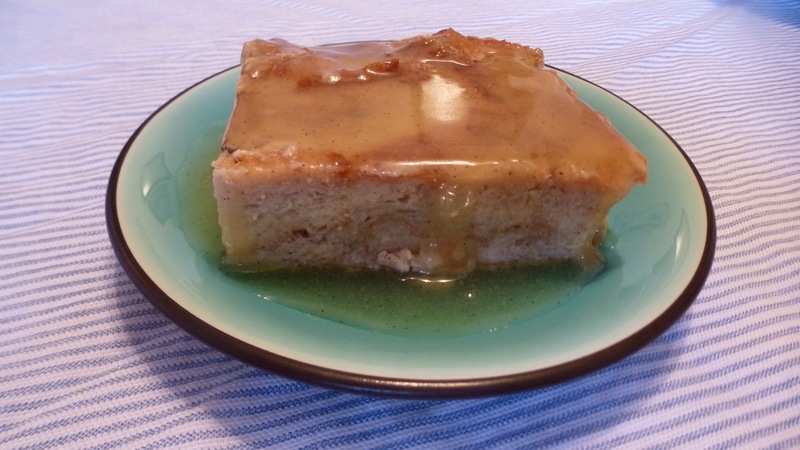 This bread pudding recipe, a nice alternative to pie for Thanksgiving or other occasions, was given to me by my friend Kim. I’ve modified it slightly to suit my taste. It is wonderfully rich and delicious, a special occasion treat. I use large croissants from Costco for this recipe, but an equal volume of smaller ones would work as well. Preheat oven to 350 degrees. Butter a 9×13 glass pan. Boil 4-5 cups of water for a water bath. Line the bottom of the pan with sliced croissants, cut side up. Sprinkle bread with cinnamon sugar. In a large bowl combine milk, cream, eggs, and sugar. Whisk until well mixed. Scrape vanilla bean seeds into the custard mixture. Add vanilla extract and salt. Whisk until smooth and sugar has dissolved. Pour over croissants. Use a fork to press croissants into the custard. Let sit 15 minutes so they can absorb custard. Place bread pudding pan into a larger rectangular roasting pan. Place in oven and pour the boiled water into the roasting pan to come half way up the sides. Bake for 50 minutes until pudding is set. Cool on rack. Make the sauce in a 2-quart saucepan by melting the butter on medium low heat. Add cream, sugar, vanilla bean seeds, vanilla extract, and salt. Cook until sugar has dissolved and mixture is hot. Do not boil. Serve with sauce spooned over individual portions of bread pudding. Serves 12. This entry was posted in Breads, Breakfast, Christmas, Custards, Desserts, Easter, Sauces, Thanksgiving. Bookmark the permalink.